Throughout Moscow’s turbulent history of centuries of invasions, revolutions, persecutions and misfortunes, Orthodox Christianity, the religion chosen by the Russians in the 10th century over all other religions, has held particular significance for Muscovites. The Orthodox Church has been and continues to be dominant as a phenomenon not only of religion, but also of culture and architecture. Evidence of Moscow’s rich and eventful past has been carefully preserved through its many magnificent and iconic cathedrals and churches. The intent of this exhibition is to present a brief visual introduction to some of the characteristics of Moscow cathedrals and churches from four periods of Russian architecture: Early Mucsovite period (1230 -1530); Middle Muscovite Period (1530 -1630); Late Muscovite Period (1630 -1712); and the Imperial Russia Period (1712 - 1917). 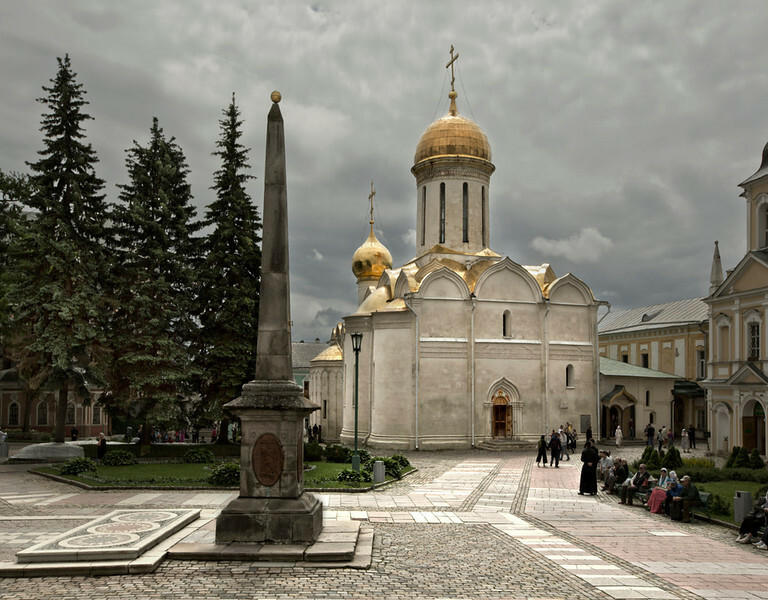 To the northwest of Moscow is the town of Sergiev Posad which boasts the most important monastery in Russia, the picturesque complex of the Trinity Lavra of St. Sergii. Erected in 1475-1479 and flanked on the left by the Hall of Facets, Moscow’s most ancient municipal building and on the right by the Church of the Twelve Apostles, the simple but austere Cathedral of the Assumption was the main temple of Moscow, the cathedral where tsars were crowned and metropolitans and patriarchs were ordained. 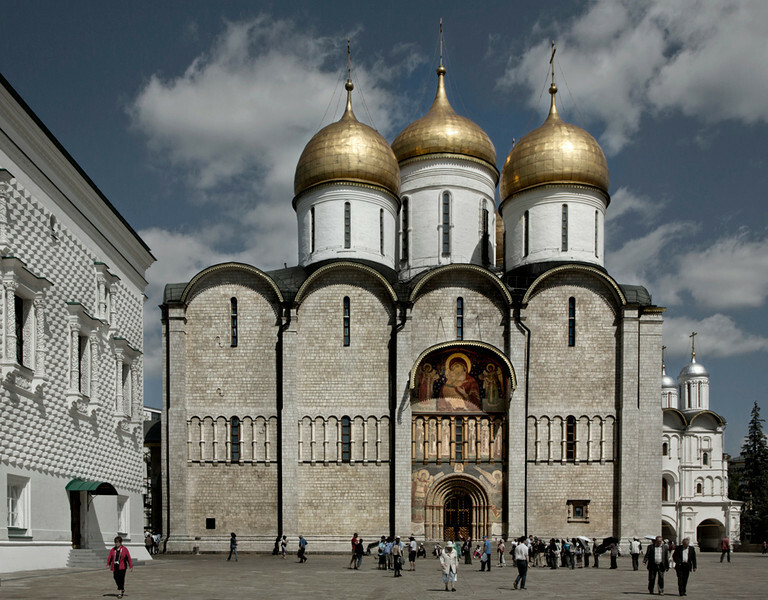 Built in 1485-1489, the impressive Cathedral of the Annunciation in the Kremlin stands on the foundation of a former 14th century church. In its early history, it was a house church of the Grand Dukes of Moscow. From the 14th century, Kolomenskoye, in the southern part of Moscow, was the summer residence of great Moscow princes and Russian tsars. It was built in 1529-1532 by Grand Prince Vasily III to honour the long-awaited birth of his son, Ivan IV (Ivan the Terrible). With its characteristic features of a 70 meter high elongated tent roof and arrow-shaped windows, it was a striking and bold departure from Byzantine architecture. 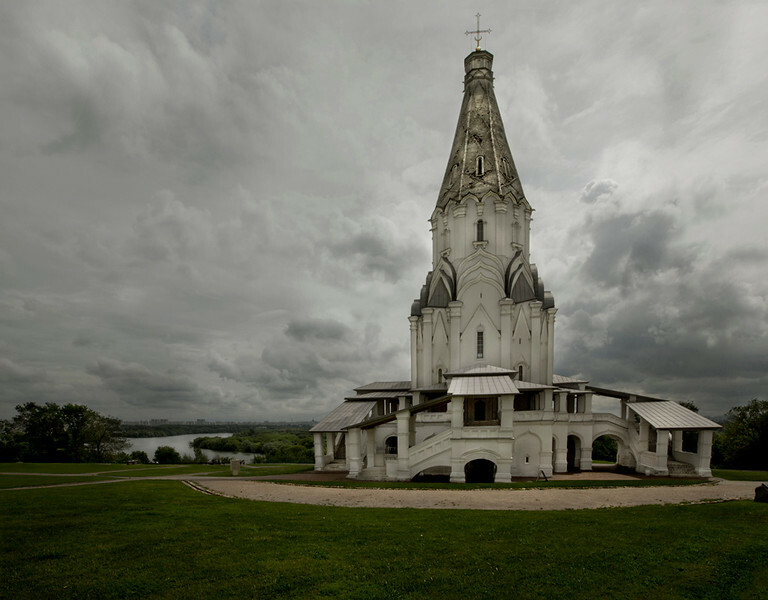 The church is considered to be the first stone tent-roofed structure of its kind in Russia. 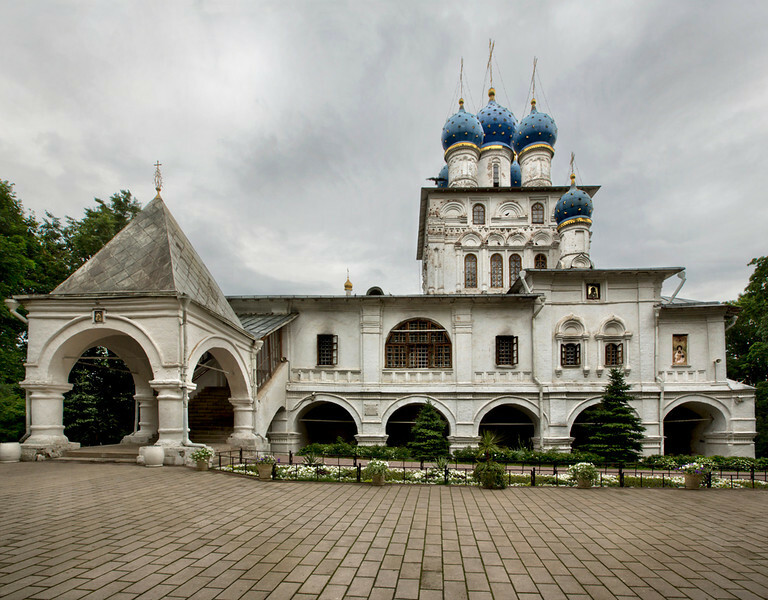 Built in 1649-1653 for Tsar Alexis I, the Church of Our Lady of Kazan at Kolomenskoye commemorated the centenary of the seizure of Kazan from the Poles by the Muscovite army under Ivan the Terrible. 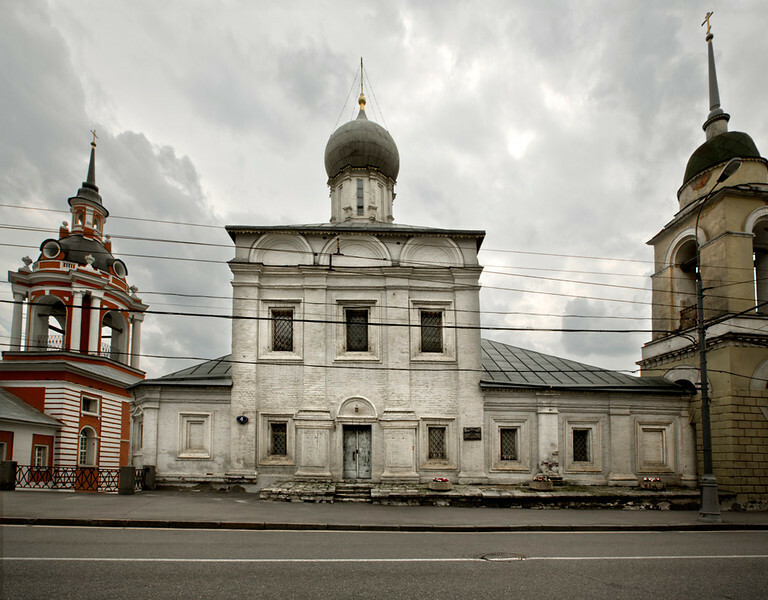 The two-storied stone church, an early example of Moscow Baroque, stands on a high basement and has two stairways with porches on the south and north sides that lead to the first floor of the building. The five blue domes with gold stars are a departure from the golden domes of the 15th century. The Church of St. Maximus in Kitay-Town and in close proximity to Red Square, was built in 1697-1699 by two medieval merchants with merchants’ funds. The church was named after “God’s fool,” St Maximus the Confessor, who was buried in 1484 by the original wooden church on the same site. An enormous undertaking, construction of the Cathedral of Christ the Saviour began in 1839 and was not completed until 1883. Situated close to the Kremlin in the centre of Moscow on the Kropotkinskaya Embankment of the Moscow River, it was built to commemorate the victory over Napoleon’s army in 1812. The stunning architecture of the structure was similar to that of two Kremlin cathedrals, the Cathedral of the Assumption and the Cathedral of Michael the Archangel. In 1922 the cathedral was closed down. On December 5, 1931, the third attempt by Stalin’s government to demolish the cathedral was successful. The site eventually became a very large public swimming pool for 30 years. 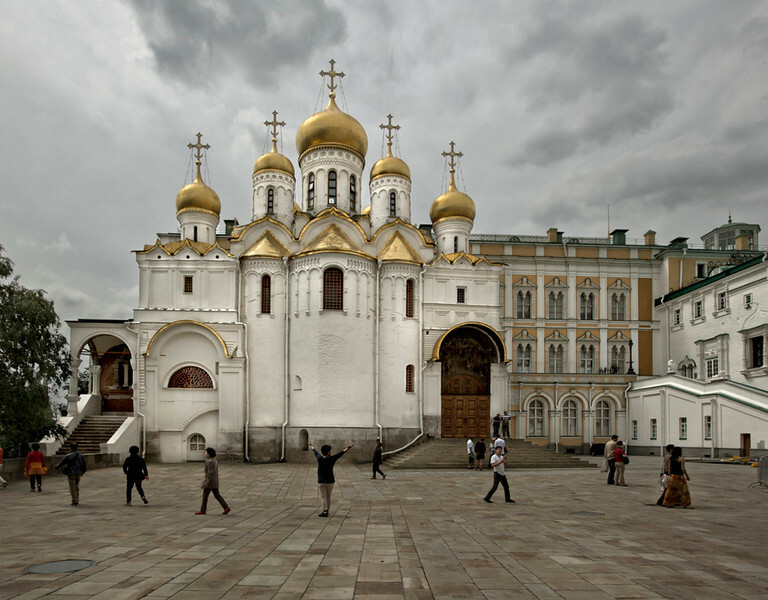 In February, 1990, with the end of Soviet rule, the Russian Orthodox Church received permission to rebuild the cathedral, which began in 1992. 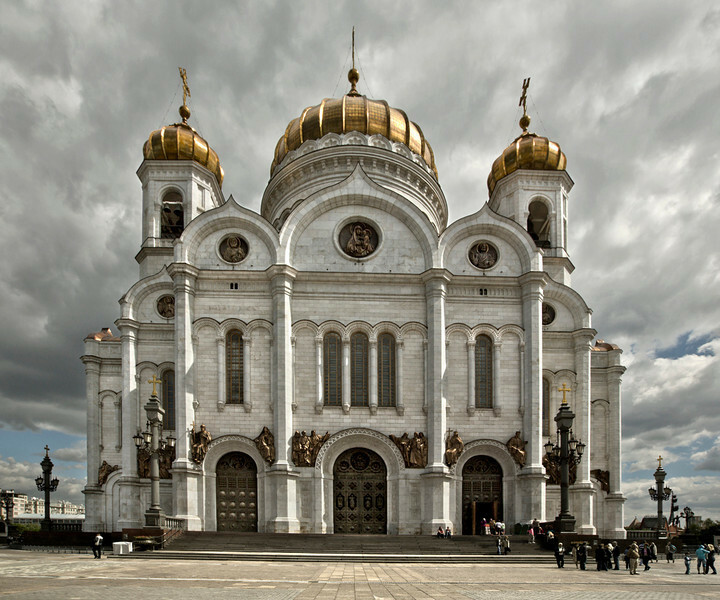 The restored cathedral, the largest Eastern Orthodox Cathedral in the world, was consecrated in the year 2000.